Loongson recently unveiled two new quad core processors Loongson-3A2000 & Loongson-3B2000 targeting respectively consumer electronics and server, and on the company’s new GS464E architecture using MIPS64 cores. Both processors are 4-way superscalar processors built on a 9-stage, super-pipelined architecture with in-order execution units, two floating-point units, a memory management unit, and a crossbar interconnect. According to Imagination Technology, Chinese media reported that 3A2000 CPU was designed at high-performance consumer electronics products such as desktop computers and laptops, 64-bit embedded and DSP applications, and network routers, while 3B2000 will be used in 8 to 16 core server systems, meaning there would be 2 to 4 quad core processors in these servers. Loongson GS464E is the most recent processor architecture introduced by Loongson Technology. In this paper, we describe the key aspects of the GS464E architecture. Compared to the previous GS464 architecture, GS464E focuses on improving the performance of memory access and branch prediction, using enlarged queues, caches, and TLBs in the processor. Support for the MIPS DSP instruction set and virtualization is also provided. Specifically, the memory subsystems have a 3-level cache hierarchy each with an LRU replacement policy, and also support multi-processor cache coherence. With the aforementioned optimization features, GS464E has become an innovative, high-performance processor architecture. And some results are really impressive with over 2000% improvement in memory transfer over the previous generation Loongson-3A (GS464). 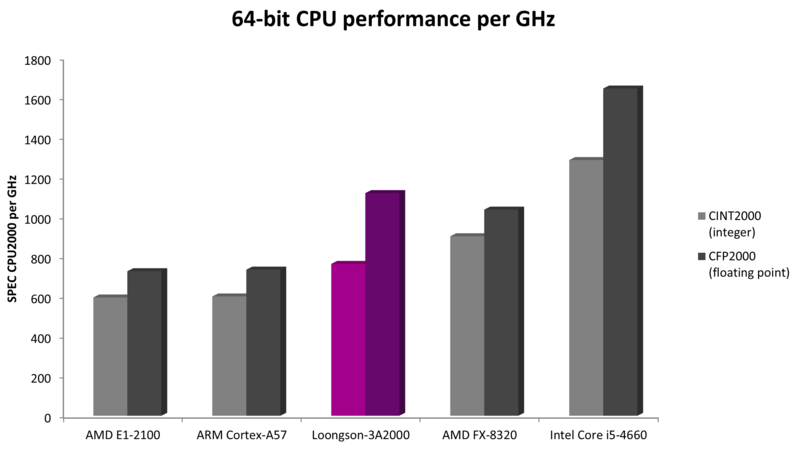 Imagination also displayed a chart showing performance per MHz is pretty good compared to AMD, ARM and and Intel. However, I could not find any power consumption data such as TDP or performance per watt, so I’m not sure the new processor excels there, especially since the processors are apparently manufactured with a 40nm process technology. However, two new chips to be released in 2016 – 3A3000 and 3B3000 – will be built using 28nm process node and clocked at 2GHz. The new Loongson processors run Linux (Loongnix distribution), and previous versions of the processor could also run OpenBSD, so it might be ported too. The new processors should soon be found in devices sold in China. Here is a thread talking about a Loongson-based laptop called Lemote. Thanks for that … it does indeed look interesting but I couldn’t find it on sale anywhere , not even on aliexpress where I buy my Chinese stuff. They were in the past MIPS SOCs based media players on the market made by Realtek(RTD1073 had a 400MHz MIPS24Kc processor,RTD1186, etc.). I’d like to buy some MIPS stuff but I don’t want to have to buy exotic hardware or get it just be cause it’s MIPS … Maybe Chromebooks could be a start for some MIPS SOCs as they are architecture agnostic. IMO they should really make Android architecture agnostic too but that might take a while … not sure why they haven’t though since they solved the native code problem for Chromebooks. I think the 3B2000 should have 8 cores, all the previous 3B chips were octacores acording to available materials. The 8-16 cores figure is probably for uni-processor and dual-processor boards? Yeah I know about that one but that’s pretty weak … ARM has some pretty powerful stuff available and more stuff to choose from. Still if PowerVR makes some sort of open source driver available I might consider that board … otherwise I’d rather get the RPi 2.